Since the 17th century, villagers in Vatican City used scales to portion food brought in from local farmers to give to the less fortunate. In 1922, the Panella family opened a restaurant in the nearby Roman neighborhood, Trastevere, and named it Antica Pesa (The Antique Scales) in support of the generosity of their fellow countrymen. Generations later, in 2012, the family opened an outpost in Williamsburg Brooklyn, paying homage to their Roman home. This New York neighborhood, like Trastevere, has not only grown from the grim times that have helped forge its character but it is also located on the other side of a river, with the heart of the city facing it. Both establishments follow two fundamental guidelines: to rework traditional recipes from Roman cuisine and to utilize local, seasonal and mostly organic products, with a nod to modern trends. The Panella family will soon open a third Antica Pesa in Shanghai, China as they continue in their international pursuit to share their cuisine and ideology. La dolce Brooklyn. Decades-old Roman hot spot Antica Pesa lands stateside, bringing with it a star-studded scene. Video: It’s the NYC hotspot where everyone from heads of the State to Hollywood stars like to be seen. Warm up this Winter at These Bars with Fireplaces in NYC...this authentic Roman restaurant has a strong wine selection and a fireplace that sits in the heart of the restaurant. New food vendors at Smorgasburg...Antica Pesa will create Roman street food including the Italian ramen burger? The Brooklyn Brand Goes Global...Francesco Panella has made it his mission to take Brooklyn to Europe through his television show "Brooklyn Man"
The Coveteur's Guide to Williamsburg and Greenpoint...where Antica Pesa serves some of the best pasta in the city. This Italian restaurant has created a Cachaça-based cocktail in celebration of the World Cup, called Coppa Vittoria (Victory Cup). Madonna, Julianne Moore, and Mary Kate Olsen have all been and their traditional Roman menu with a present-day flare is not to be missed! Off-court Italian...Novak Djokovic took a break on his day off from the US Open on Wednesday by heading out to dinner in Brooklyn. The Williamsburg kids might not care about Roman import Antica Pesa, but the A-list celebrities and moguls sure do love this place. Madonna had an intimate dinner in Brooklyn with boy toy Brahim Zaibat this week. Ivanka Trump interview. Favorite restaurant? […] I also really like Antica Pesa in Brooklyn. Great Ideas. 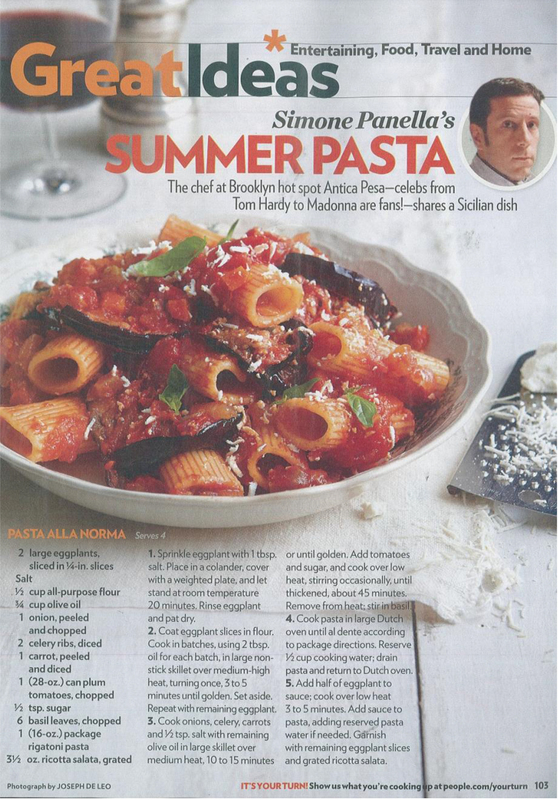 Simone Panella’s Summer Pasta. Sightings . . . Sting and Trudie Styler at Antica Pesa in Williamsburg . . .
Madonna & Tom Hardy Enjoy a Romantic 'Dark Knight' Out?! Brooklyn’s Antica Pesa was the place to be Thursday night for star sightings over spaghetti. Madonna brought daughter Lourdes and son Rocco to the Italian restaurant at the same time as actor Tom Hardy. 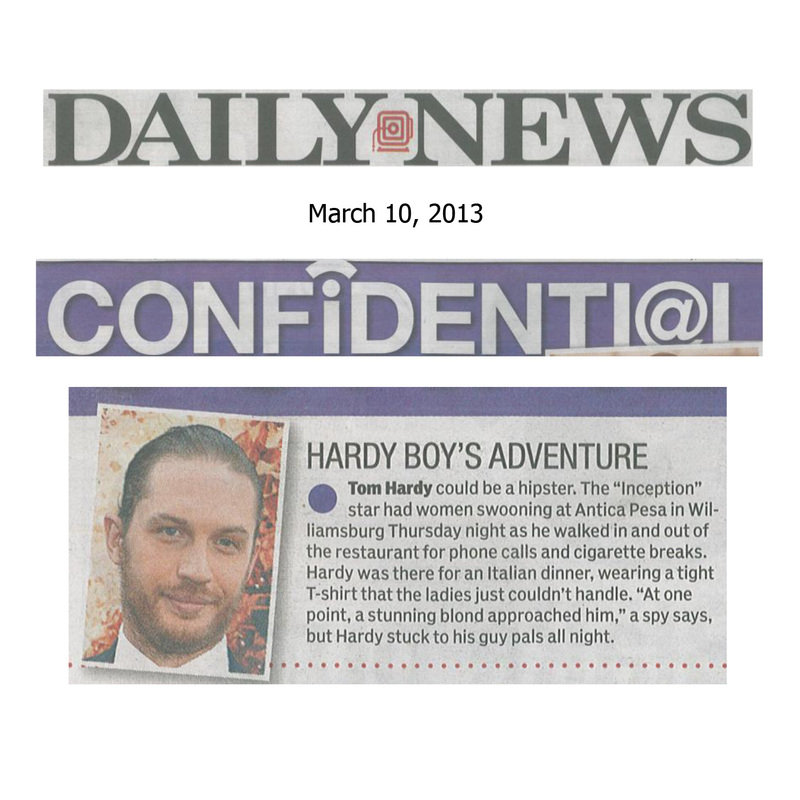 Tom Hardy could be a hipster. The “Inception” star had women swooning at Antica Pesa in Williamsburg Thursday. Rossetti and Volanti are both chefs at this Billyburg restaurant, an American outpost of the same-named institution in Rome — a favorite of Madonna, Leonardo DiCaprio and Quentin Tarantino that’s been open since 1922. When not in Rome, pretend you are, at the second outpost of Antica Pesa – just opened in Williamsburg, Brooklyn, and a sweet little sister-venue to the original Italian landmark. Following the lead of the many lauded NYC chefs who have opened second and third restaurants here, one of Rome’s most celebrated restaurants, Antica Pesa, just opened its first stateside outpost not in Manhattan, but in the Brooklyn neighborhood of Williamsburg. Mangia, Mangia! Famous Roman restaurant Antica Pesa has made its way to Brooklyn, N.Y.’s Williamsburg neighborhood, where celebs including Madonna have dined on their favorite Italian fare. Antica Pesa boasts a spacious bar and lounge area up front, where a fireplace beckons guests to sink into brown leather couches and banquettes. We choose Williamsburg in Brooklyn because it reminded us of Trastevere, the neighborhood in Rome in wich we are located,” said Francesco Panella, who owns the new spot Antica Pesa on Berry Street with his brother. Antica Pesa is the sister establishment to an 80-year-old restaurant of the same name in Rome. The stylish Williamsburg outpost is operated by two members of the family that owns the original. Where do you eat in Rome? Is it right that you love the Trastevere district and especially the Antica Pesa restaurant, which has now opened a U.S. branch in the Williamsburg section of Brooklyn, in New York City — and has just survived the Sandy storm? Madonna’s guitarist Monte Pittman was spotted dining at Antica Pesa in Williamsburg. The menu includes traditional Roman pastas, soups, salads, and grilled meat dishes, all made with local ingredients. Antica Pesa brings an ambitious contemporary twist on traditional Roman dishes to the increasingly bourgy ‘burg. One of my dining partners said, “This tastes like a fluffy cloud.” I’ve never tasted a cloud, so I can’t verify. The sprawling menu specializes in saltimboca, and the kind of light, veggie-forward fare that’s appropriate for both farm-to-table Brooklyn and waifish waistlines. We hear… That Antica Pesa, the Rome hot spot where Zac Efron and Madonna have dined, launches in Williamsburg on Friday and has already hosted private dinners for guests including Mayor Bloomberg . . .
Truffled “Eggs In A Jacket”: sauteed spinach, leek & potato puree & truffle oil in what basically looks like the most delicious fried paper bag since that time you were still hungry after finishing all the San Gennaro zeppoles. Brothers Francesco and Simone Panella—who own the Roman location—offer dishes like spaghetti cacio e pepe, roasted lamb and Italian ham served with hot, crispy mozzarella, accompanied by a list of all Italian wines. Antica Pesa is available for a variety of events including weddings, birthdays, luncheons, showers, holiday parties, filmings, etc. ranging from large party bookings to full buy-outs. We even have a semi-private space that can seat up to 25 which is separated from our main dining room by the lounge/fireplace area. If you are looking to plan an event between 12 to 85 guests, please click the Event Inquires button below to provide us with more information so that we can get back to you with our seasonal event package and pricing details. Homemade orecchiette pasta served with a sautéed broccoli rabe and anchovy sauce topped with fresh burrata cheese from Andria, Italy, and homemade anchovy "caviar"
Our seasonal cocktail list is based on both classic cocktails and Italian mixology trends. These unique infusions are designed to offer you an emotional experience directly from our Italian lifestyle and culture. We are always looking for new talent to join our team. If you are interested in a career at Antica Pesa for any of our available positions, please click the Apply Now button below.